Bringing together all the realms of design – mixing patterns, styles, flowers and textures – is what a lovely tableau embodies. Decorating a living room from top to bottom, left to right can take a good while … your favorite fabric will either be on backorder or astronomically expensive or BOTH, the lamps need fabulous shades but you can’t find the right harp size so you have to go to Atlanta for harps, your painter is 6 weeks out and the furniture just never arrives on time. Setting a table, for me, gives me that “hit” I need to quench a bit of design desire. I love to mix china patterns and linens, creating a cadence with high and low stemware – the whole setting can change my everyday white or cream dinner plates into something special just with fun flowers. Interior design is an evolution and takes time to bring it all together. A collected tabletop too can take time, but there’s just something so special about using what you have, or as I like to say, “Mimi’s, Mama’s, Mine” and allowing the food, the flowers and the seasons to take charge and create the truly memorable setting. It can be the same plates every time, but different food and flowers make it fresh and fun. I also love to be a tad unapologetic towards custom and tradition when setting the table too. For example, who really uses their great-great aunt’s silver fish knives and forks for a fish course alone? I don’t, but I do love to use them in general! Our meals now are more so limited to two or three courses (not to mention served off the stove and not from first and second footmen), and if you’re serving salmon, use Auntie Irene’s fish set! A tureen too is perfect for centerpieces just as a silver Revere bowls are perfect for floating camellias. Just because it was intended for one purpose in one generation does not mean we have to that way in our generation. The reverence and respect for using and cherishing and keeping the items is such a fine gesture – keeping something unpolished, dust covered or forever stacked in the sideboard is the real loss when it comes to tabletop heirlooms. 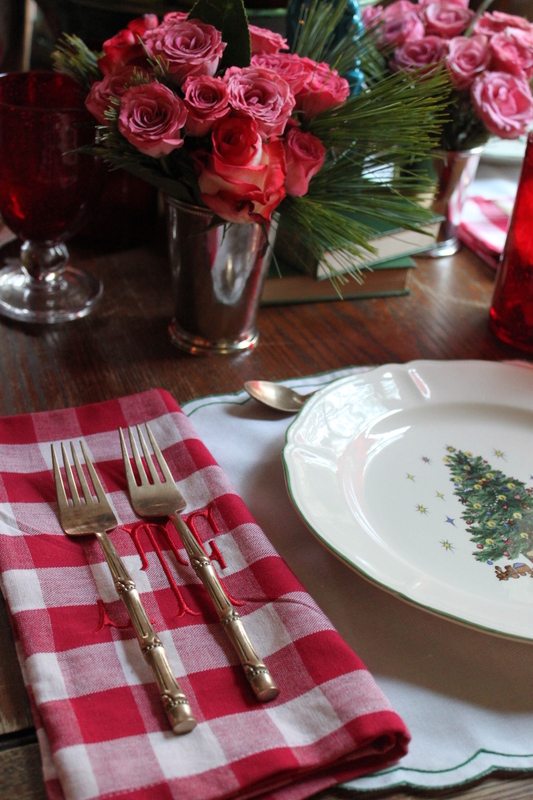 Two tablesettings this Christmas were true celebrations of the season. 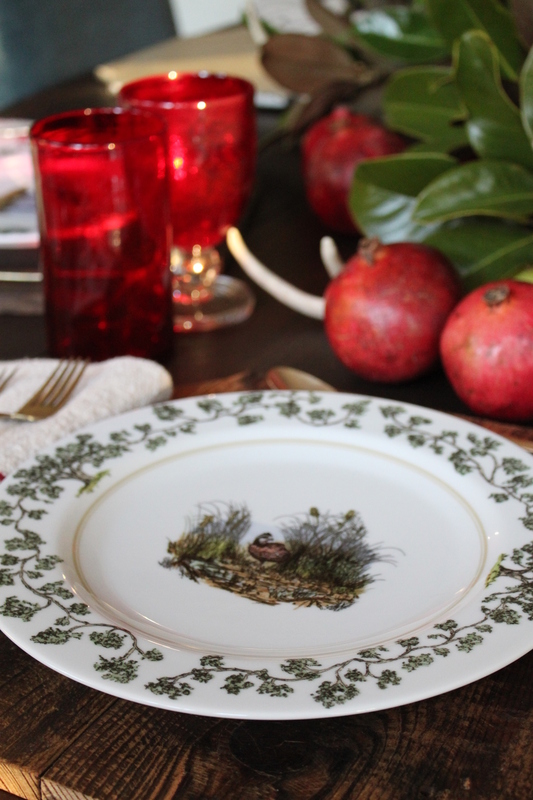 My baby sister, Meredith, has started a terrific blog, and her tablescape in our kitchen at Farmdale warmed my heart. She used a mix of pinks and reds, new and old, fruit and flowers and a touch of whimsy. The placemats were our grandmothers, the china was our mama’s and the roses came from Publix! 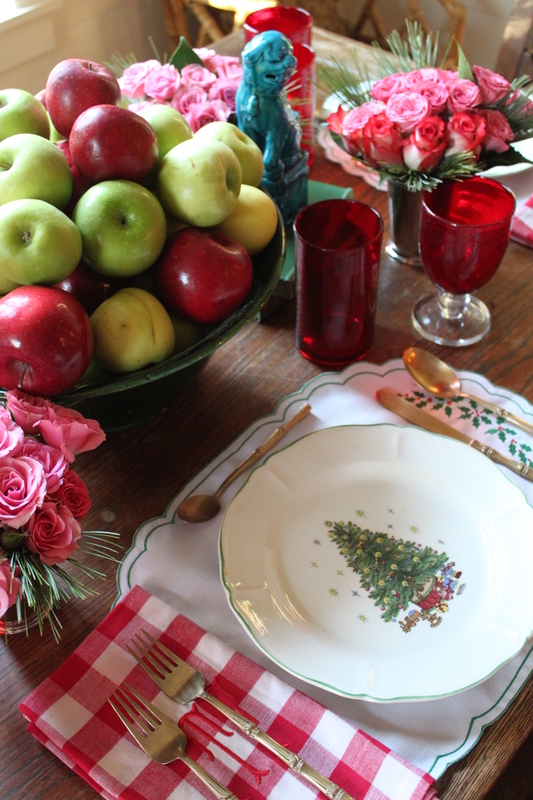 I love the story with Mama’s Christmas china – she bought it on June 17, 1982 – the day I was born! She went into labor with me in antique store – how apropos is that! I can’t drive thirty miles without stopping at an antique shop or mall or side of the road treasure stand! I brake for antiques! Meredith mixed these with some of my favorite color (plaid – to me it is a color – ha!) napkins and gold bamboo flatware. She used bubbly glass stemware in a highball and goblet and mounded red and green apples in a big green bowl as the centerpiece. Now I love a good centerpiece, but a centerpiece with “satellites” is my fave! Silver julep cups with white pine and store bought roses in varying shades of pink were so fun with the hemstitched linens and kept the setting lively and not too “matchy-matchy.” For a dose of fun and whimsy, she used her turquoise foo dogs perched atop green leather books – the turquoise is such a fun pop of color that it truly made the red and green and pink that much more lively. To carry on with the color scheme, I took on the dining room table and used the same gold bamboo flatware and the same red, bubbly glass stemware as she did in the kitchen. I love these highballs and goblets and carry them in my shop – they come in a wide array of colors, so I love to have a handful of styles and colors on tap – it really changes the looks of a tablescape. 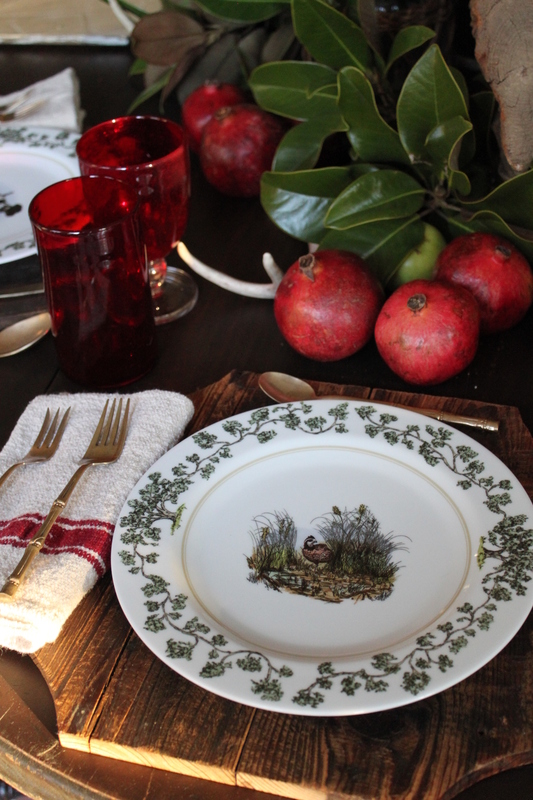 Using my William Lamb dinnerware like I did at Thanksgiving was an easy choice, but I paired with pine and magnolia and some loose antlers too – all scattered down the tables with deep red pomegranates, grain sack style napkins and some gorgeous pink camellias. Of course, I kept my taxidermy there too… I mean when is a stuffed otter and wood duck not appropriate on a dining table, huh? I always quote Mimi when I give these lectures and talks about Southern-style entertaining. She always said that we “eat with our eyes first” and that we “feed people body and soul when they’re at our table.” That said, set a pretty table y’all and feed your folks something that sticks to more than their ribs. Setting the table is just fun for – and just might be my favorite part of design. 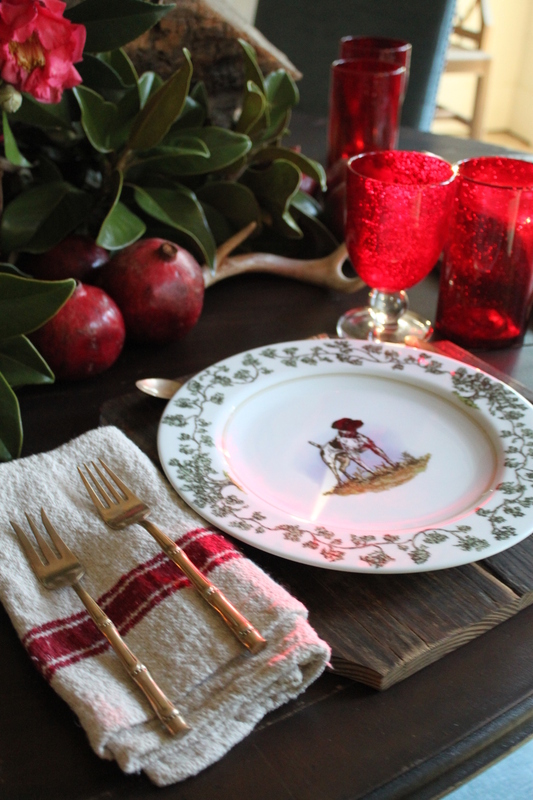 I hope y’all had a lovely holiday season and enjoy some of these tablescapes from Farmdale.